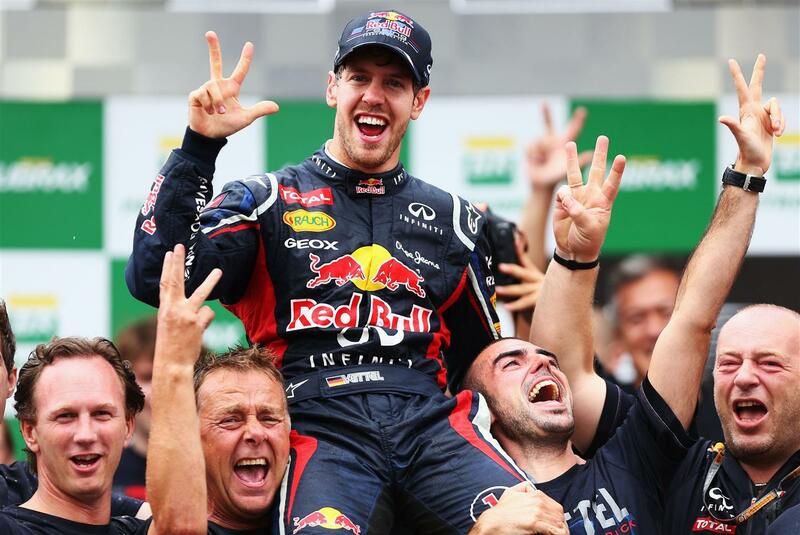 Sebastian Vettel has become the youngest ever three-time Formula 1 world champion, after a sixth place finish at the Brazilian Grand Prix ensured a three-point buffer over himself and Ferrari’s Fernando Alonso to clinch the title once more. Jenson Button won the race at Interlagos, which played out as unpredictably as the whole 2012 F1 season, mainly thanks to sporadic showers often making tyre choice a true gamble at times. Vettel had to overcome almost instant disaster on the first of 71 laps after Williams driver Bruno Senna collided with 25-year-old German at the forth corner, spinning the Red Bull racer in the opposite direction and causing what looked like serious damage to the floor of his car. Championship rival Alonso on the other hand drove a supreme race to second, albeit helped out by teammate Felipe Massa on numerous occasions; the Brazilian aiding the Spaniard’s progress with some efficient blocking and also kindly letting the sister Ferrari swoop past. A flutter on dry tyres in rainy conditions meant that Vettel had to make two pit-stops in short succession, putting him out of the points momentarily, but a prolonged safety-car period soon reeled him in with the rest of the pack and was able to progress through the field. Pole sitter Lewis Hamilton battled down at the front with McLaren teammate Button and Force India’s Nico Hulkenberg for most of the race. The young German and Button stayed out, however, whilst others came in for intermediates and were able to speed away with good pace. The soon to be Sauber driver even inherited the lead for several laps, including the first of two safety-car periods. Hulkenberg, however, was to be the cause of Hamilton’s demise; the 2008 champion’s car being collected by Hulkenberg’s on the first corner almost three-quarters into the race and damaging Hamilton’s front-left wheel beyond repair. A very dismal end to the 27-year-old’s final race with McLaren. F1 veteran Michael Schumacher was able to leave the sport for the second time with a respective race; the 43-year-old finished seventh and even had a small part to play in Vettel’s happiness with the seven-time champion easily letting through his compatriot to take sixth place. With Alonso driving his heart out to second and Vettel four places back, the latter claimed the 2012 title by a mere three points in a season that has thrown curveball after curveball. A whole round of driver changes will now ensue, with Hamilton off to replace Schumacher at Mercedes and Sergio Perez taking the Englishman’s seat at McLaren. Hulkenberg, as mentioned, will join Sauber in 2013 and Charles Pic is leaving Marussia for Caterham. The Norfolk-based outfit were able to claim the vitally important tenth place in the constructors table which has vast financial benefits for the team, following a strong drive from Vitaly Petrov. Next year is the final season before revolutionary rule changes come in that sees the engines go from naturally aspirated V8s to turbo-charged V6s. Some say it is the final chance to see F1 in its most pure embodiment, but no one in truth knows how the new regulations will affect the sport except from financially.